The Holy Grail story is familiar to many in the western world; to some it is an icon of literature and to others a source of comical amusement thanks to Monty Python and the Holy Grail. It is absolutely true that the Holy Grail represents the divine knowledge gained at the end of an inward spiritual journey—knowledge that is gradually lost through the cyclical ages that Hesiod, Vedic and even Hermetic traditions speak of. Traditionally, it is a legend commencing in late 12th century, created by French and German poets like Wolfram von Eschenbach in Parzival. The Holy Grail takes various forms: a plate or bowl containing the bread of Holy Communion for the Fisher King. It is also portrayed as a stone cast down from heaven on which the abstaining angels stood for sanctuary when Lucifer rebelled against God as mentioned in texts like Isaiah and Ezekiel. The gem was given to Adam when he lived in the Garden of Eden after the rebellion of the angels. When he and Eve were cast out, the Grail was lost to him as well. Seth, Adam’s progeny, was said to have gained re-entry into Eden and to have recovered the sacred vessel. Significantly, Seth remained in paradise for 40 years. The number 40 is itself a mystical motif; Moses wandered for 40 years in the desert, with Noah on the ark 40 days and nights, for Jesus was tempted for 40 days. It is also a cup in which Joseph of Arimathea collected Christ’s blood on the cross. More modern interpretations include Mary Magdalene as the receptacle of Jesus’ seed as the foundation for the “Merovingian bloodline,” as the authors of Holy Blood Holy Grail have theorized. The chalice is most popular today, doubling as the same cup used by Jesus in the Last Supper. Joseph of Arimathea is said to have brought the Grail to England, which then became an important part of the Arthurian myths. The Holy Grail myth also links to ideas of gnosis in its relationship to humanity and the world, especially the world of nature and its elements. 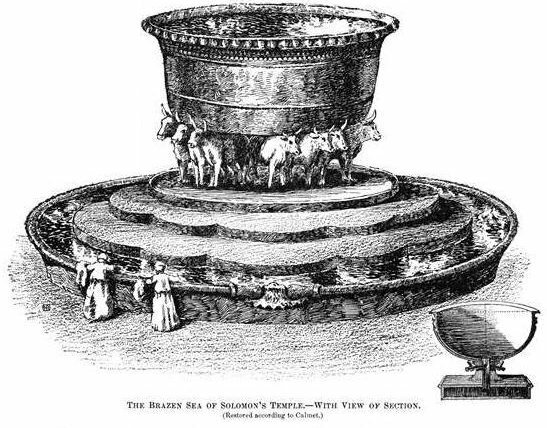 In our upcoming book Baphomet: The Mystery of the Temple Unveiled by Tracy Twyman and Alex Rivera, we go into great explanation that the Holy Grail cup wasn’t just the vessel for the holy blood of Christ but was actually connected to the Krater of Hermes and the Ophite/Orphic Bowl of the coiled dragon-like serpent (please see our book for more details on this). It is also connected to the idol head that the Templars supposedly worshiped, being Baphomet. 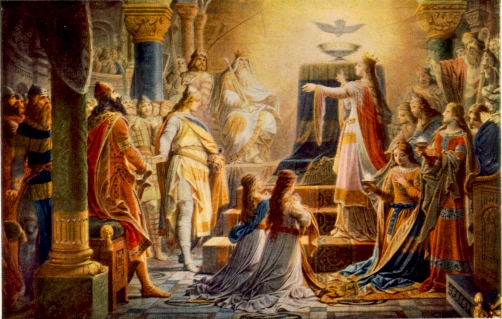 Author authors like Julius Evola, have argued for a non-Christian and even Hyperborean origin for the Grail legend, in his book The Mystery of the Grail, a possibility in which we will explore later in the second part of this post at a future point in time. When we isolate the texts that make up the Grail cycle, we find that they repeat a few essential themes, which are expressed through the symbolism of knightly figures and deeds. What we are dealing with, then, are essentially the themes of a mysterious center; of a quest and a spiritual test; of a regal succession or restoration, which sometimes assumes the character of a healing or avenging action. Percival, Gawain, Galahad, Ogier, Lancelot, and Peredur are essentially various names portraying the same human type; likewise, King Arthur, Joseph of Arimathea, Prester John, and the Fisher King are equivalent figures and variations on another theme. Also equivalent are images of various mysterious castles, islands, kingdoms, and inaccessible and adventurous lands, which in the narratives are described in a series that, on the one hand, creates a strange, surrealistic atmosphere but, on the other, often ends up becoming monotonous. “1. As an immaterial, self-moving object, of an indefinite and enigmatic nature (“it was not made of wood, nor of some metal, nor of stone, horn, or bone”). As a cup, bowl or tray, often of gold and sometimes adorned with precious stones. 32 So the soldiers came, and broke the legs of the first man and of the other who was crucified with Him; 33 but coming to Jesus, when they saw that He was already dead, they did not break His legs. 34 But one of the soldiers pierced His side with a spear, and immediately blood and water came out. 35 And he who has seen has testified, and his testimony is true; and he knows that he is telling the truth, so that you also may believe. 36 For these things came to pass to fulfill the Scripture, “Not a bone of Him shall be [a]broken.” “They shall look on Him whom they pierced.” 38 After these things Joseph of Arimathea, being a disciple of Jesus, but a secret one for fear of the Jews, asked Pilate that he might take away the body of Jesus; and Pilate granted permission. So he came and took away His body. Note the extraordinary hiatus John introduces into the narrative at this point. Clearly he wants us to note something of supreme importance: the legend is that Joseph caught some of this blood and water in the chalice used for the last supper. I think we can really see the Grail as both objects simultaneously, and that its atemporal “absurdity” is essential to the salvific nature of Christ’s blood: How could the blood shed on the Cross have gotten into the cup of the Last Supper other than by having traveled back in time? Christ’s blood is either made of tachyons (hypothetical faster-than-light particles that most physicists currently reject) or is, in effect,outside of linear Time altogether. Only if Christ’s blood is outside of Time and Cause does it make sense that the cup that once ever held it must have always held it and will keep holding it eternally—and there is just one thing known to physics that has those properties: The blood of Christ is, in effect, light. Blood symbolism is extremely important in the Grail mythos: In the Old Testament, it is the substance of life. Jewish temple worship revolved around outpouring of blood, and sprinkling of blood via animal sacrifice. It is taken into the Holy of Holies and sprinkled on the mercy seat on Day of Atonement (Leviticus 16). Blood atones for sin and makes everything holy again. It is the seat of the spirit within the body, but it is also the animated life-force, of the body. It that which contains, as it were, the soul of the body. Jesus, as the Heavenly Priest of Melchizedek, also wearing the breastplate of Aaron. Also known as the “Urim and Thummim.” It is clear that Jesus is the “initiator” for the “Mysteries” of God in the Heavenly Temple. On Ezekiel 44:6, 7 the Lord rebukes “rebellious” Israel for profaning his temple by offering him food in an unacceptable manner. What is his food? According to v. 7, “the fat and the blood;” similarly in v. 15 where only the Zadok priests may ”offer me the fat and the blood, says the Lord God”. There you have it! His “food” is blood and fat! Should we accept this literally? Yes, in the sense that blood and fat were literally offered to him. But No because he did not consume either. Why does he say this, then? Because the blood, actually poured outside into a Temple drain, symbolizes the spirit’s separation/expiation from sin; while the fat, when turned into smoke, symbolizes the spirit’s ascension to him for acceptance. God’s “food,” then, is simply the language of symbol, and it means that separation/expiation from sin (by the blood) and ascension of purified souls (the rising smoke) are the things he desires from people. Most assuredly, I say to you, unless you eat the flesh of the Son of Man and drink His blood, you have no life in you. 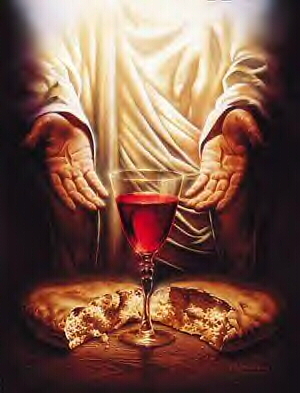 Whoever eats My flesh and drinks My blood has eternal life, and I will raise him up at the last day. For My flesh is food indeed, and My blood is drink indeed. He who eats My flesh and drinks My blood abides in Me, and I in him. Jesus implores his followers to consume his divine flesh and blood made up of of spiritual light to regenerate their own fallen meat sacks degenerated as a result of Adam and Eve’s exile from Eden and from the consumption of the fruit of the knowledge of good and evil. Hence, the Holy Grail cup is said to contain the Christ’s saving blood of the Lamb—the remnant or leftover spiritual substance dripping from a primal trauma of a divine being, who is crucified by the rulers and authorities of the lower heavens, dies and resurrects so that his followers can follow his example, so that they might be salvaged from the sinfulness of the lower world/cosmos of the devil, which is destined to be overthrown, cast out and destroyed at the end of the apocalypse. The saved and elect are transferred into a new kingdom or reality of God while the rest who rejected the Gospel are destroyed. Many of the Cathars believed what the mythicist scholar Earl Doherty theorizes was the earliest form of docetic Christology: that Christ was never incarnate on earth. Most of the radical dualist Cathars believed that the whole Jesus narrative, from the beginning of his ministry to his crucifixion, occurred in heavenly world of the good god and in the astral realm of the demonic rulers. In the Parzival romance, the impotency of the Fisher King being his maimed, never-healing state (all thanks to Klingsor’s Spear) reflects the sterility of his land. It also reflects the nature of matter itself. In the studies of pagan practices by such scholars as Sir James G. Frazer in The Golden Bough: A Study in Magic and Religion, the recurring themes of the killing of the previous high priest or king to be replaced by a new avatar (much like John the Baptist and Jesus) and the marriage of fruitfulness of this new avatar with a female deity/queen is essential to the vegetative and natural fertility and prosperity of the land. The mirroring effect between the human enactment of natural prosperity and vice versa is apparent enough in the Priest-king of the Grail, Anfortas or the Fisher King’s “Waste Land” is to appropriate this mythic pagan belief into a solid representation that the barrenness of the soul/mind and body reflects upon the surroundings/ environment and nature. This, one might say is the objective co-relative function where the emotions, experiences of the subject becomes objective reality, hence the idea that the imaginal/spirit/ideal realm controls the realm of matter and the manifest world. The Magi have certain means of evasion; for example that the gods neither obey those with freckles nor are seen by them. Was this perhaps their objection to Nero? But his body was without blemish; he was free to choose the fixed days, could easily obtain perfectly black sheep, and as for human sacrifice, he took the greatest delight in it. So, in other words, could the Catholic Eucharist be just a Christianized magical ritual? We certainly see Romans who viewed the Christians as simply a diabolical secret society addicted to sorcery and the conjuring of daimons, as seen in Celsus in the True Doctrine and Suetonius in Nero 16.2. All of this seems to be a precursor for the Medieval and modern gossip and rumors of witch covens and Satanic elite secret societies, like the “Illuminati” who engage in human sacrifice and Faustian pacts with demons. The drinking of wine in Dionysian rituals involved ritually imbibing the spirit of Dionysus, which is like drinking the Elixir of Life, or “being baptized in wisdom.” The wine is the blood of the earth, “fruit of the vine and work of human hands.” This wine is used as a commemoration of ritually consuming the blood of Jesus. The Gospel of John chapter 2, where Jesus transmutes water into wine certainly plays on this distinctly Dionysian idea. So the outpouring of Christ’s blood on the cross is the outpouring of his very life—the spirit of the Son of God. 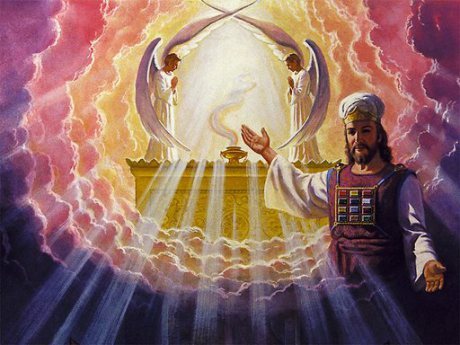 The Book of Hebrews (9:22-24) tells us that the blood of Jesus (and all the Old Testament sacrifices) were necessary in order to cleanse things in the heavens–the same place in which the angelic rebellion was said to have occurred as recorded in Revelation. In Genesis 1, the Spirit hovers over the face of the deep at the onset of creation. Water signifies the chaotic, untamed and unformed material of creation. It is the proto-element out of which all creation, the whole cosmos, including humanity, is ultimately made (Gen 1:2, 6; Ps 29:3) So crossing the waters of the great Flood, the waters of the Red Sea, the waters of the Jordan, and the waters of baptism are the recreating and renewing waters of creation. This water baptism acts like a conduit that transports the believer from one world (the old man of sin) to another (the newness in Christ). 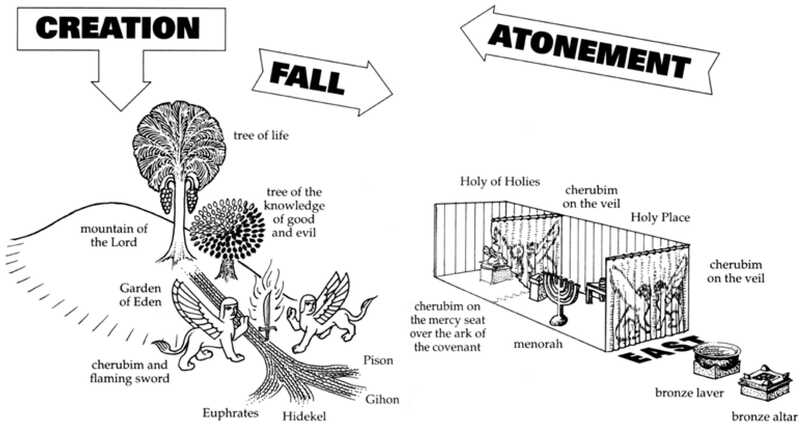 Likewise priests must bathe in water before entering Holy of Holies of the Temple of Solomon on day of Atonement. Similarly with the Sea of Glass in Revelation 15:2, beside which those who have defeated the beast are standing, singing the song of Moses. This is a reflection of the “Molten Sea” which was a large basin in the Temple in Jerusalem made by Solomon for ablution of the priests. It is described in 1 Kings 7 and 2 Chronicles 4. It stood in the south-eastern corner of the inner court. We need to pause for a moment to reflect on this: the incarnated Son of God took on the likeness of humanity upon himself, meaning that this was not his original nature: this humanity, united to the Second Person of the Trinity, is literally poured out from his side upon the cross. This body and blood is NOT the same as the body and blood of communion, although they are clearly related. The bread and wine of Holy Communion are the substance and blood of the earth, transfigured by the Spirit of God to become our spiritual food and drink as the Eucharist. The chalice in itself is not the real Holy Grail—that is simply romantic myth. 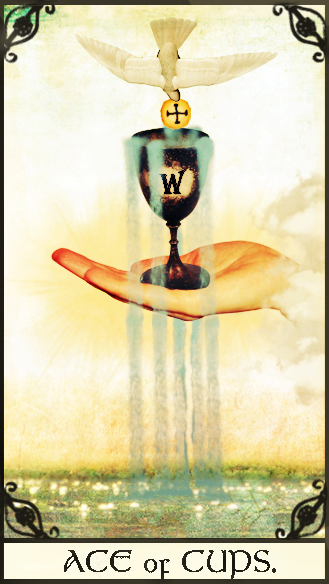 The real Holy Grail is the very ground onto which this blood and water is sprinkled upon. The earth itself received the body and soul of Christ in his death. This is the blood and water of his sacrifice, rather than the blood and body of communion, although again, clearly the two are related. The bread and wine of communion—Christ’s body and blood—rather than being consumed by us to become part of our body, performs a spiritual function, transforming us into the body of Christ. “Though we are many, we are one body because we all share in the one bread.” Thus consuming Christ’s body and blood transforms us into itself. Likewise with Christ’s blood and body out poured on the cross—it transforms the whole of creation into Christ’s body. Christ’s physical presence, although hidden, still abides throughout the very fabric of the universe. His humanity, which is our humanity, abides in creation, even today, transforming it and making it holy. In a sense, this relates to the infamous Baptism of Wisdom ritual of the Knights Templar in which we discuss in the book, at length. Christ’s crucifixion and the Harrowing of Hell, in effect, unseated and usurped the power and possession of the authorities, archons and their demonic possession of the world and perhaps even the “Wasteland” of the Fisher King, a reflection of the inner state of the sinner. The quest for the holy grail to heal the wounded king and to restore the land to its original, pristine, Edenic state. Many see this as related to Matthew 4:19 in which Christ said, “Follow me, and I will make you fishers of men.” This reference would later become crucial to the Christian version of the Fisher King of the Arthurian Grail romances. Being reared by their mothers. For they could not contain their foolish pride and refused to worship the gods above and to sacrifice to them upon the altars. Hesiod calls them “big children” (mega nepios) and tells how, disgusted with their impiety and arrogance, Zeus decided to wipe them off with a cataclysm, burying them in Tartarus, much like how Jehovah sends a flood to wipe the giant children of the Watchers and condemns the fallen angels in the abyss-like underworld in chains. Essentially all mythologies speak of similar wars between Blacks and Whites or between Angels and Devils, Devas and Asuras, Daevas and Ahuras, the Sons of Light and the Sons of Darkness, Gods and Titans, etc., etc. This all seems to influence the story of Klingsor who injures the Fisher King with a spear. Klingsor also happens to be directly related with Faustus as we will see in Part 2. …in Isaiah 58:11 and Jeremiah 31:12 the people themselves are a “well watered garden,” implying that Paradise on earth consists of an ideal relationship between God and humans. This is a key reason why the Divine spirit is not given solely or primarily for uttering profound prophecies, performing marvelous miracles, or making doomsday declarations, but for subduing the Sinful Inclination and renewing God’s “image and likeness” within each of us, and in so doing we become like a well watered garden, Genesis 2:10, bearing good fruit for the one who did the planting. This is the true Paradise, the true Garden of Eden while we are here on earth. And that which waters one’s personal garden is the Divine spirit. The sprinkling of his blood on the earth, prefigured in the Old Testament by the sprinkling of the blood of the sacrificial bull and goat in the Holy of Holies, has made the world the Holy of Holies, the dwelling place of God, signified by the rending of the veil in the Temple. Yet it remains hidden, invisible and unknown, until the day that the new heaven and new earth are revealed when Christ return again in glory as discussed in Matthew and Revelation. Just like the hiddenness of the glory of God, momentarily revealed in the burning bush, or on the Mount of Transfiguration. In that day we will see that “in him we live and move and have our being.” The sacrificial bull concept, however is an ancient Rome and eventually later from Mithraic sacrificial rites. The Gospel of John tells us that after the death and resurrection of Jesus, the Baptism of the Holy Spirit is made manifest to the believer, and the Body of Christ. According to the Excerpts of Theodotus, the Valentinian teacher Theodotus said that the baptism releases the believer from the clutches of passions, Fate, destiny and demonic powers that infest the lower world in which mankind finds himself exiled in. 76 As, therefore, the birth of the Saviour released us from “becoming” and from Fate, so also his baptism rescued us from fire, and his Passion rescued us from passion in order that we might in all things follow him. For he who was baptised unto God advanced toward God and has received “power to walk upon scorpions and snakes,” the evil powers. And he commands the disciples “When ye go about, preach and them that believe baptise in the name of the Father, and of the Son and of the Holy Spirit,” in whom we are born again, becoming higher than all the other powers. 77 Therefore baptism is called death and an end of the old life when we take leave of the evil principalities, but it is also called life according to Christ, of which he is sole Lord. But the power of the transformation of him who is baptised does not concern the body but the soul, for he who comes up [out of the water] is unchanged. From the moment when he comes up from baptism he is called a servant of God even by the unclean spirits and they now “tremble” at him whom shortly before they obsessed. 78 Until baptism, they say, Fate is real, but after it the astrologists are no longer right. But it is not only the washing that is liberating, but the knowledge of/who we were, and what we have become, where we were or where we were placed, whither we hasten, from what we are redeemed, what birth is and what rebirth. A procession comprising the knights and the twenty-four maidens attending the Grail entered the hall, only Repanse de Schoie being permitted by the sacred object to be its bearer. These attendants were grouped in numbers, first four, then eight, then twelve divided into two sixes. Each group carried corresponding numbers of lights. Last came the “princess” of the Grail carrying one. This sequence has baffled many commentators, but Kahane and Kahane point out the marked similarity with the Hermetica, where the groups in the same order “represent the twenty-four stations of the journey of the soul: 4 elements + 8 spheres + 12 signs of the zodiac + 1, the Monad. . . . The Grail procession, in other words, is a representation of the mystic journey of the soul towards the Monad, itself symbolized by the Grail” (op. cit., pp. 105-6). The end of the Grail quest is the return to the source of life and rebirth into it as divinely self-conscious entities purified by involvement in earthly experiences and having also contributed to the ongoing process of cosmic evolution by refining the substance they have used. The great lesson for Parzival — for all of us because he is our prototype — was the interconnected relationship of all earth entities. The bonds of a universal brotherhood make us all kin. The suffering of one hurts all, and compassion in our heart obliges us to ask forever: What ails our brother? What could be the most interesting aspect of this story, involves looking at the second clue of what the Holy Grail represents, provided by Wolfram in the form of “a precious stone, lapsit exillis (i.e. lapis or lapsi ex caelis) of special purity, possessing miraculous powers conferred upon it and sustained by a consecrated Host”, which is indeed the blood of Christ, with holy powers to act as the Elixir of Life. This precious stone fallen from heaven is both the emerald fallen from Lucifer’s crown. Wolfram von Eschenbach identified the Holy Grail as a Stone of Heaven, he knew he was alluding to a Holy Grail tradition that had extended far back into the mists of time. Many traditions tell so primitive man, who experienced a physical and or emotional change just by being in the proximity to certain stones. Even the term “magic,” associated with the title of “Magus” or “magician” has its etymological roots in the force of magnets or magnetism, which plays into the idea of “greatness,” or “magnifying” one’s spirit or essential self under the light of God. Perhaps this is why Simon was called “Megas” Greek for “Great” which sounds virtually the same as “Magus.” The Persians thought of the their priests as “magos” as well. Saint Michael saw GOD’s anger, plagued by His insolence. In such a way that a stone jumped out of it. Lucifer’s fall that is incorporated into this poem first popularized by the Prophet Isaiah during his harangue against the King of Babylon. When describing the decline and all of the King of Babylon, Isaiah used the metaphor of the Morning star’s “fall” or descent below the horizon at sunrise, an image subsequently became linked to Lucifer when translated into Latin was Luz-I-fer or Lucifer, the Light Bringer. Morning Star then became known as Shahar or Helel, which were the names of Venus’ dawn appearance. Thus, Lucifer is associated with both Venus and Helel, a name that evolved into Hell, Lucifer’s underworld home. In the Book of Ezekiel, he expanded upon the meaning of Lucifer’s infamous fall. While comparing the King of Tyre with Lucifer, Ezekiel identifies Lucifer as the anointed cherub and forever-young boy who once walked in the Garden of Eden while covered in precious stones, including the emerald, and was perfect in his ways and from that day he was created until iniquity was found in him. Thus Ezekiel perpetuated the tradition of Isaiah by making Lucifer’s fall the product of pride. The remainder of Lucifer’s legend in the poem states that during the battle with Michael an emerald became dislodged from Lucifer’s crown and fell to Earth. This is based on Ezekiel’s description of the gems-especially the emerald-that adorned Lucifer’s regalia in the Garden of Eden. It is also influenced by the Knights Templar. But of course this predates the Templar’s by many thousand of years. Before their time the emerald had been recognized as the esteemed Stone of Venus, the “fallen star” of Lucifer. Strangely enough, however, Lucifer does seem to embody the twin archetype we see over and over in world mythologies. In a way, Michael the archangel could also very well be his angelic twin, just as Metatron is said to have an angelic twin soul in the form of Sandalphon. Both of these angels’ lower selves exist in the forms of both Enoch and Elijah, both of which are intimately connect with Hermes Trismegistus. In Roman myths, we have Romulus and Remus, in Genesis, Cain and Abel, Ariman and Angra Manyu in Persia, the Ashvin Twins, or Mitra and Varuna in India; Zeus and Poseidon, Castor and Pollux, Apollo and Dionysus and Hercules and Atlas in Greece; Set-Typhon and Horus in Egypt, etc. In a way, Lucifer is simply a reflection of the Supreme Heavenly Father, who is the spiritual sun of Heaven. As the story goes, a number of angels having remained neutral and inactive during the battle of Lucifer and the rebel angels against God and the faithful heavenly hosts, after Lucifer’s fall they were condemned by God to support this stone, which had dropped from Lucifer’s crown, hovering between Heaven and Earth until the hour of redemption of sinful mankind and the “Day of Judgement” at the end of the apocalypse. Then they brought it to Earth, and, formed into a holy vessel, it served for the dish out of which the Jews ate the Paschal lamb in Exodus 12 on Passover, and in which Joseph of Arimathea received the Saviour’s blood, and perhaps even the receptacle for the severed head of John the Baptist. By uniting the two objects, being the kraters and with meteoritic stones fallen from heaven, it becomes obvious. We see ancient worship of meteorites in the Kaaba Stone of Mecca in Saudia Arabia, which is associated with the worship of Venus/Lucifer and Saturn/Chronos, the pyramids of Mexico, the vajra thunderbolt of Hinduism, etc. So the Grail is indeed the meteorite crater opened up by a falling object from the heavens. It may also refer to volcanic activity and magma, associated with the conflagration spoken by the ancients that is said to have destroyed Atlantis-Eden. Firstly, we should ask: What is a foundation stone? Also called a “cornerstone,” a foundation stone is a stone ceremoniously set in place at the start of the construction of a building. This is done to initiate certain defining principles or ideas in connection with the proposed building with the intention of consecrating it for a specific purpose. It is, if you will, a “mental” building to use modern terminology, to correspond to a physical building proposed. Students of spiritual science would likely be comfortable with the idea that the “soul and spirit” foundations of the building were being laid alongside of the sense perceptible building itself. Indeed, the Foundation Stone concept can be found all throughout the Old Testament and in the Jewish apocrypha, especially in 2 Enoch (see my paper “The Gods of Imagination: Alchemy, Magic, and the Quintessence” found in The Gnostic 6 by Andrew Phillip Smith). It is the starting point or even the “heart” in which the world and even the whole breadth of the cosmos is founded upon. It is also the Holy of Holies, in which it becomes the “cornerstone” of the Temple of Solomon, which is just another form of the Grail Temple of Parzival. Perhaps this is where the Theosophists would claim that Shamballah of Tibet would be the “heart of the earth” and the “King of the Earth” being “Sanat Kumara,” the so-called “Lord of the Flame” came from Venus! This is undoubtedly connected to Lucifer, the equivalent of Rex Mundi of the Cathars, Melek Taus of the Yezidis, Satan “the god of this world/cosmos” to St. Paul and Ialdabaoth and his legions of archons to the Gnostics. As it follows, the foundation stone is currently owned by Lucifer on his crown, since he is essentially the “prince of the world,” as the Fourth Gospel puts it, when he fell into the depths of the sub-lunar realm after the War in Heaven. Carrying this idea forward to a later epoch, Exodus 40:33 describes how Moses completed the tabernacle. The Hebrew text exactly parallels the account of how God finished creation. Genesis Rabbah comments: “It is as if, on that day [i.e., the day the tabernacle was raised in the wilderness], I actually created the world.” With this idea in mind, Hugh Nibley has famously called the temple “a scale-model of the universe.” As a complement to the view of the Creation as a model for the temple, BYU Professor Donald W. Parry has argued that the Garden of Eden can be seen as a natural “temple,” where Adam and Eve lived in God’s presence for a time, and mirroring the configuration of the heavenly temple intended as their ultimate destination. What does any of this have to do with the lore and legends of Baphomet and the Knights Templar exactly? This is a very good question that is answered thoroughly in Baphomet: The Mystery of the Temple Unveiled. The Even ha’Shettiya, also known as the “Stone of Foundation,” which currently resides within the eight-sided Dome of the Rock in Jerusalem, the Holy City and center and heart of the earth as European mapmakers charted. This is the same rock that supposedly was the same rocky site upon which Abraham was coerced into sacrificing his own son Isaac in the sight of Jehovah, to test his faith, as well as the place where Mohammed was lifted into Heaven by the archangel Gabriel. This is also the same site that the Knights Templar resided nearby when they founded modern day Jerusalem. So the Stone of Foundation for the Jews, Muslims, and the Catholic Crusaders was in fact, the Stone of Lucifer as part of the Axis Mundi or column that unites Heaven and Earth, and even the Underworld. 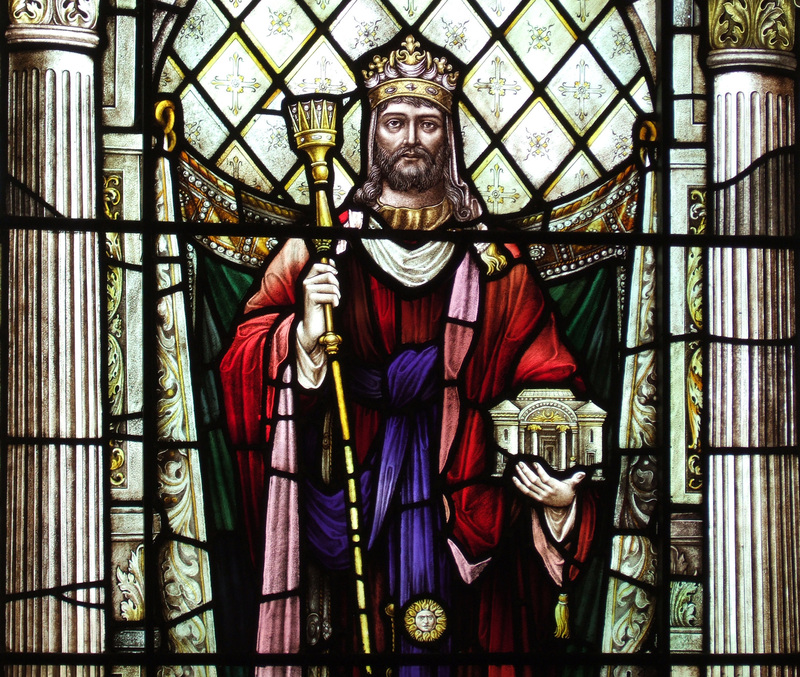 King David, who purchased the rock of the Even ha’Shetityya from the Jebusites as the location of the Ark of the Covenant, was not overlooked by him. This sacred object primarily served as a vehicle for communication with Jehovah/Yahweh. King Solomon holding the Grail Temple and Royal Scepter. Perhaps the pyramids of Egypt and Mexico were constructed by similar means though the use of demonic, supernatural power. Furthermore, perhaps this is what the Knights Templar were so drawn towards—the supernatural power behind the Temple of Solomon—the same power that would one day make them so rich that they would become a threat to French and Catholic nobility. It is this power that manifest itself in the form of a head of a man or even of a cat, and eventually from the Dionysian and Azazel-like goat head. Misunderstanding is almost certainly at the root of the allegation that the Templars worshipped an idol called Baphomet. Descriptions of it varied, but it was usually described as being a life-sized head, which was said to make the land fertile (as is said of the Grail). That the Templars did possess heads is without doubt. They possessed the head of St Euphemia of Chalcedon at their preceptory in Nicosia on Cyprus, and, more curiously, a silver head shaped reliquary was found after the arrests at the Paris Temple. This bore the inscription CAPUT LVIII, and inside it were parts of a woman’s skull (who was believed to have been one of the 11,000 virgins martyred at Cologne with St Ursula). The heads may have indeed been worshiped, in the way that the Celts revered the head. The Assassins, during their initiation ceremonies, buried the initiate up to his neck in sand, leaving only the head visible, before disinterring him. Given their simulation of Saracen torture, the Templars may also have carried out this practice. A further possibility is that Baphomet, long thought to be a mistranslation of ‘Mahomet’ (the Prophet Muhammad), could well be a corruption of the Arabic word abufihamat, which means ‘Father of Understanding’, a reference to a spiritual seeker after realization or enlightenment has taken place: ‘The Baphomet is none other than the symbol of the completed man.’44 It is therefore possible that the supposed head the Templars worshipped was actually a metaphorical head. That Hugues de Payen’s shield carried three black heads suggests that certain elements within the Order – the upper echelons perhaps – were involved with esoteric disciplines learned from the Sufis from the very beginning of the Temple’s existence. Could these “alchemical heads” be code words for a secret knowledge held by the minds of the initiated as well as literal severed heads who supposedly “prophesied”? The Templars were also said to have in their possession, ritual skulls made out of precious metals and human bone covered in gold and silver. These skulls may have been their own deceased brethren. There are testimonies taken from the Catholic inquisitions that purport of the Templars alluding to possess metallic skulls used in Templar ceremonies, especially in the legend of The Necromantic Skull Of Sidon. Skulls tend to be used in ancestor worship and also happen to be the premiere emblem of Mexican commemoration of the Dia de los Muertos (“Day of the Dead” being a pre-Colombian tradition of ancestor worship and colonial Catholicism) and demonic deity of the drug cartels, Santa Muerte, a mixture of the Virgin Mary (who, herself is the Catholic version of Astarte and Ishtar/Lilith) and the Aztec god of death Mictlantecuhtli. The Yale Masonic secret society of the “Skull & Bones,” a Satanic club of which a string of U.S. Presidents belong to (John Kerry, the Bush family, etc.) via secret oaths and initiation rites into diabolism similar to the ones found in Templar Baphometic rites. These “Bonesmen” have their origins in the so-called “Bavarian Illuminati” who themselves come from the Jesuits, whose saints are often depicted next to skulls or holding skulls. There are paintings depicting Mary Magdalene holding a skull as well. The famous skull and crossbones motif normally associated with pirates is often said to have originated with this skull from Sidon, but it was probably much older. This haunting motif, which we today associate with poison, was most likely a symbol related to the earlier alchemical rites of the Templar Knights. During these early rites, skulls were used representing “Caput Mortumm” or “Dead Head,” which refers to a stage in alchemy preceding creation of the “Philosophers Stone,” which is the Great Work of the alchemists, equated with spiritualized gold. This is the stage of “Nigredo” or the “blackening” in Hades/Hell. 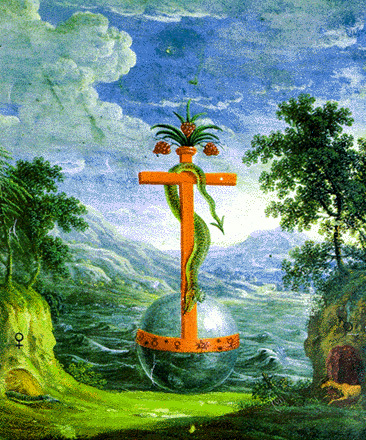 The Gnostic-Hermetist Zosimos depicts this stage in the most extreme and gruesome imagery in his alchemical work Visions. The most important skull or head used in the rites of the Knights Templar was known within the Order as Baphomet. This most sacred of heads, which many of the Knights alluded to during their depositions preceding their French trial, may have been that of John the Baptist, whose head was acquired by the Templar’s as part of treasure they looted from Constantinople during the Fourth Crusade in the 11th century. Even stranger is the fact that this Baphomet skull could also be related to the head of Simon Magus! Be sure to check out our book for more details on all of this. 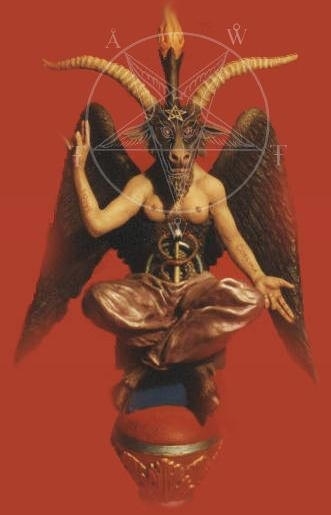 However, the idea that the Templars revered Baphomet in its Gnosticized form, seems to be a later additional detail that emerges during the French Revolution and later emphasized with the likes of Purgstall, Eliphas Levi, Aleister Crowley, etc. Whatever the case may be, it seems as though the Templar treasure is somehow tied with the symbolism of the head, the mind, as well as the Holy Grail cup which is associated with drinking the wisdom of various Hermetic and Gnostic deities and alchemists like Zosimos, as we explain in the book. Indeed, even the Holy Grail/Fisher King legends themselves have strong associations with Gnosticism, and it is this heresy that the Orthodoxy greatly desired to have stamped out of existence and absorbed into their own “universal” collective religion. I realize it’s been a long while since I’ve posted an article on this blog. But be of good cheer! A new book I co-wrote with Tracy Twyman is set to come out either late October or early November as the date is currently tentative at the moment. 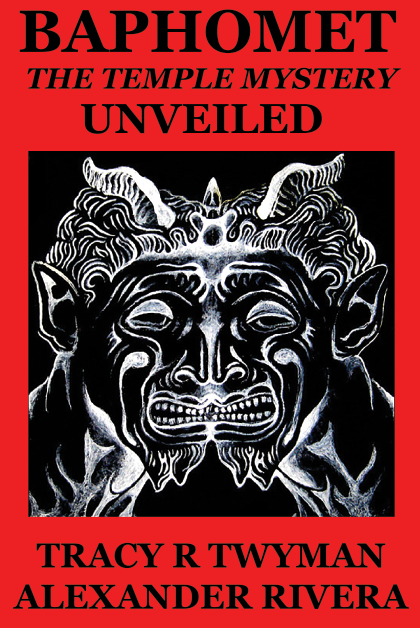 The book is called Baphomet: The Temple Mystery Unveiled. I’ve been working on this book very intently for the last 6-7 months and all my hard work (along with Tracy’s) will finally be revealed for the public to read and carefully consider. Here is the press release for the book over on Tracy’s site. Be on the look out for a Kickstarter with some pertinent details for you beloved truth seekers, to consider supporting us while giving you lot’s of cool goodies, e-books and hardcover books in return. And finally, here is the cover that will be used for the book. I will be posting more details about the book as the weeks pass on. Spread the news far and wide! Can ye drink of the cup that I drink of? And be baptized with the baptism that I am baptized with? For seven centuries, the enigma of Baphomet has mystified both scholars and the general public. Did the Knights Templar really worship a demonic idol of that name? If so, what does the word mean? What is the origin of this figure? What was the nature of the rituals that the Templars performed in secret? What were their covert beliefs? And why, if the Templars initially described their idol as a mummified severed head, is this figure now represented as a hermaphrodite human with the head of a goat? Authors Tracy R. Twyman and Alexander Rivera have dived head-first into the bottomless abyss of mystery and returned with some astounding wisdom to share. Learn the genesis of these symbols and how they relate to the Witches’ Sabbath, traditions of Sufi Islam, alchemy, Gnosticism, cabalism, the teachings of Hermes Trismegistus, and so much more. Learn why the Templars and their beloved severed head are frequently associated with John the Baptist, and how this connects to his student, Simon Magus. Discover the known facts about things like the Chinon Parchment, the Book of the Baptism of Fire, the Templar Abraxas seals, and newly-found documents which claim that the Templars discovered the real Temple of Solomon during a secret trip to Mecca. Join Twyman and Rivera on this exciting adventure into the unknown. Immerse yourself in this knowledge, if your heart has the strength. It is certain that your mind will never be the same. While this isn’t my first interview by any means, this however, is my very first audio podcast. This audio podcast features a very special guest, the author Tracy R Twyman. 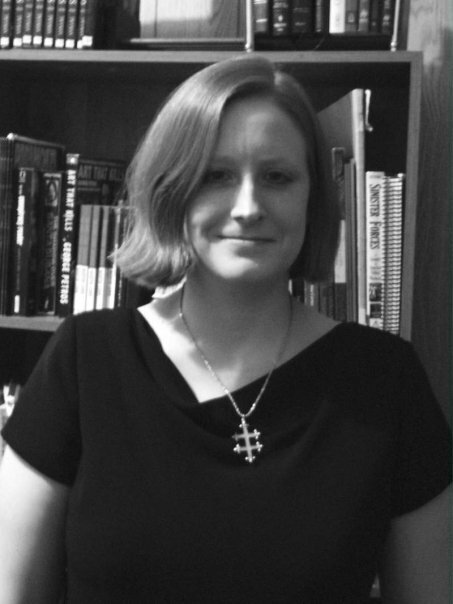 For those of you who aren’t familiar with her work, she has authored many books such as Money Grows on the Tree of Knowledge, Solomon’s Treasure: The Magic and Mystery of America’s Money, The Merovingian Mythos and many other great articles on the web going back 10 years. She has also been on Jesse Ventura’s television program Conspiracy Theory, Ground Zero Media and Coast 2 Coast. I personally think she’s done some great research regarding not only esoteric and occult subjects, but also work regarding America’s financial system, the CIA and mind-control, and many political subjects that is in the currently in the news. The subject of the Aeon Eye Podcast #1 is the ever so mysterious and occult figure of Baphomet. which is also the subject of her forth-coming book and a cruise! Also be sure to read my own deconstruction of Baphomet and Abraxas.